Makki ka Dhokla is a quintessential Rajasthani dish, and with my roots from that land, I take immense pleasure in introducing you to this traditional and vibrant dish. Makki ka Dhokla, as the name suggests, is made of makai ka atta (maize flour or yellow sweet corn flour) which is a good source of antioxidant carotenoids, minerals and vitamins. The moong dal is also rich with protein and iron. Supplementing these nutrients, I added some peas, chilies, ginger and methi (fenugreek) to enhance the flavor and texture. Next, I turned the dough into little cakes/dhoklas and steamed them. While dhokla was getting steamed, I made dal and cilantro-mint chutney to give a complete meal feel. I like the dhoklas with dal, chutney, sugar and ghee for a more filling experience. My grandmother used to prepare makai ka dhokla for me, and now I love to make it for my family in the winter. Seasonal food is definitely the yummiest thing to eat!! Makki ka Dhokla with Spicy Moong Dal (Steamed Corn Cakes with Moong Lentil Stew) is an essential winter preparation, and the actual fun of it, lies in having it in a desi way. It is quick to make and is a wholesome meal. The authentic Rajasthani way to eat it is to pour in the dal in between the small pieces of dhokla, add chutney, little sugar, lemon, ghee and mix it all together. The dhoklas are best eaten fresh, but the dal can be made beforehand. Also, you can easily make this an appetizer or side dish by making smaller dhoklas and serving them with cilantro-mint chutney! Try this recipe this winter and savor its bold flavors! Makki ka Dhokla with Spicy Moong Dal (Steamed Corn Cakes with Moong Lentil Stew) - the quintessential Rajasthani dish! 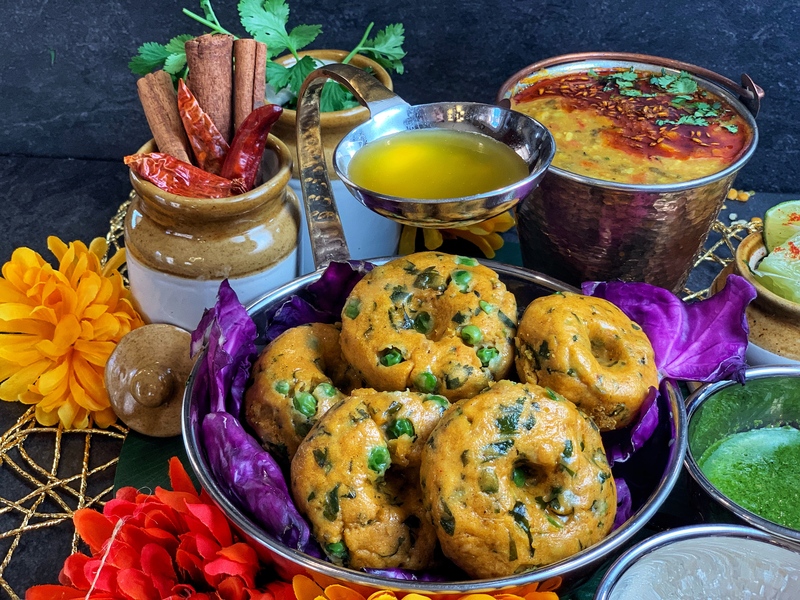 Try these steamed corn cakes with peas and methi (fenugreek) leaves and spicy, protein rich moong dal, chutney and ghee, for a wholesome, finger-licking meal this winter! In a bowl put maize flour, salt, red chili powder, coriander powder, turmeric powder, garam masala and oil. Mix everything together. Now add baking soda, peas, cilantro leaves, and fenugreek (methi) leaves to the flour mixture. Mix it well. Gradually add water to make a soft dough that will roughly hold its shape. Form the dough into round discs about 2-3 inches in diameter. Flatten them a bit and then using your fingers, press down in the middle to create a small indent, that will ensure even cooking and serve and a place to add ghee later. Steam them for 20 minutes in a greased dish. It can be done in a bamboo steamer, stainless steel steamer, or idli stand. For the first five minutes do it on high heat. After that make it medium heat for 10-15 mins. For the very last minute, make the flame higher and then remove if from the stove. Once the dhoklas are done, pour some ghee on top. It is important to use ghee as it enhances the flavor and will keep them moist. Wash the moong dal thoroughly and soak them in warm water for 30 minutes. Drain the dal. Put it in a pressure cooker with the water, salt, and turmeric powder. Cook it for 3 whistles on medium heat. Let the steam release and then open the pressure cooker and churn the dal. If you don’t want to use a pressure cooker you can also boil the dal in the same way, just without a cover. Make sure it is tender once you turn off the heat. Churn it in the same way. In a pan, add the ghee and heat. Then add cumin seeds, bay leaves, cardamom, hing, garlic, ginger, green chilies, cloves, and dried chili once hot. Sauté for a minute and add tomatoes, red chili powder, kasoori methi, and add 2 tbsp water. Cover the pan and cook for 5-7 minutes on medium heat. Add the boiled dal, garam masala, and lemon juice. Let it simmer for 5-10 minutes on low heat. Serve steaming hot dhoklas with dal, ghee, chutney, onions, tomatoes, and sugar. Crush the dhoklas, pour dal and other items, then enjoy! You can also add some ghee to enhance the taste. Dhoklas can be not only a main dish, they can also be served as an appetizer or snack. For this, you do tempering, where you can add spices (mustard seeds, cumin seeds, curry leaves, and bell peppers) in oil and let them crackle. Sauté the dhoklas in it and serve. You can even make mini dhoklas for a snack and then do tempering and serve them with chutneys like mint, tamarind and garlic.